From the above, you’d be forgiven for thinking I’ve been to see the recent production of Richard III in York, and to be honest the idea of watching it at the pop-up theatre (in a car park) amused me, but with the year I’ve been having, I looked at the cost of tickets and thought no way! Plus, I wasn’t quick enough off the mark and tickets had been booked by the WA group before I’d made up my mind when I could go and what I wanted to see, but in retrospect, maybe fate was playing her part. Cut to August, and my contract was not going to be renewed (hooray, no 60 minute drive [minimum] to and from work anymore) and father-in-law had passed away. 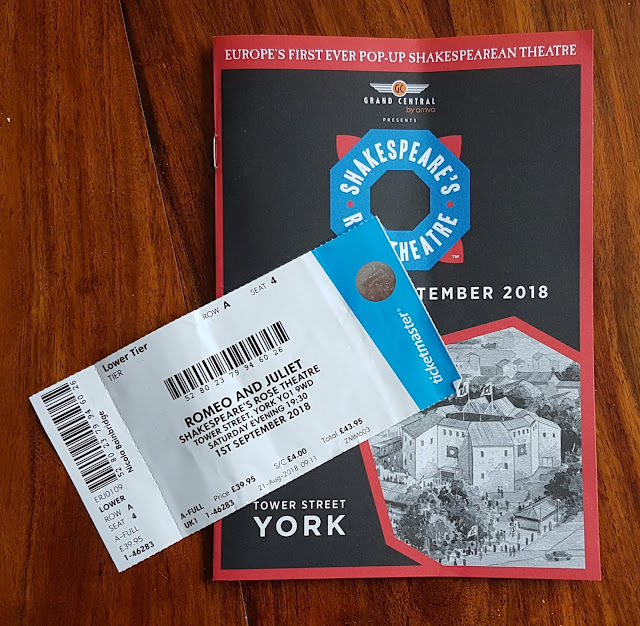 My mate got in contact to say she was thinking of heading to York to watch Romeo and Juliet, did I fancy a get together with her and someone else. She could get a ticket for about £40. 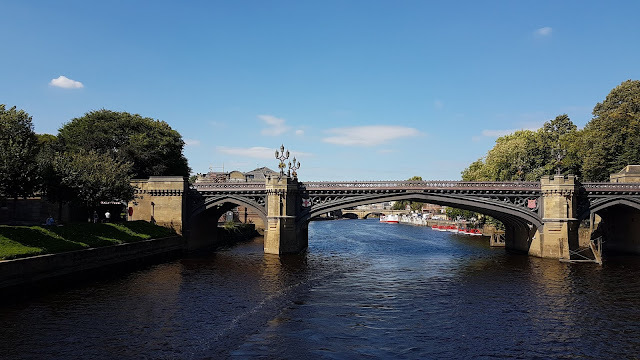 I love York and it would be nice for a catch up so yes, a weekend away was just the tonic. A celebration to being unemployed!!!!! As the end of August approached, a deal was made with work…yes I would come back, but only for 3 days a week until the end of November, I WAS NOT DRIVING DOWN THOSE COUNTRY ROADS IN THE WINTER. So our plan was to meet Friday and watch the play Saturday. 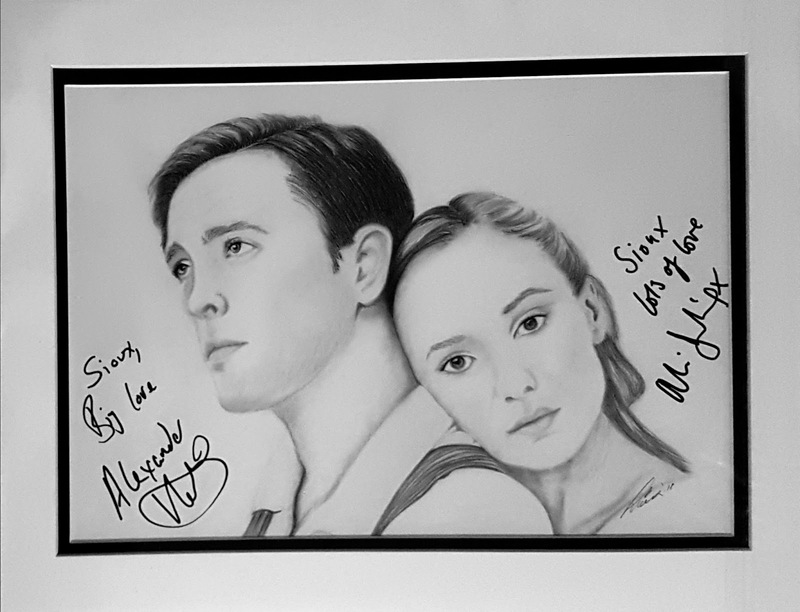 My friend had been called away with work, she was going to get to the hotel later than planned, so with time to kill and a sketch pad in the back of the car, I decided to start a sketch of Alexandra Downing and Alexander Vlahos in their roles of Romeo and Juliet. If I caught them after the show it would be something to sign. I normally take play scripts along to be signed rather than programmes, but I’m not a huge fan of Shakespeare, so whilst I have an old volume of the complete works which belonged to my mum, I wasn’t going to be buying any new versions, and I couldn’t be bothered with a programme when this was the one play he’d written I knew a fair bit about! The pop-up Rose Theatre was fabulous. Set alongside the imposing 13th century Clifford’s Tower, a medieval village had been created on the periphery showcasing the best food and drink that Yorkshire had to offer, creating a unique environment for theatregoers. 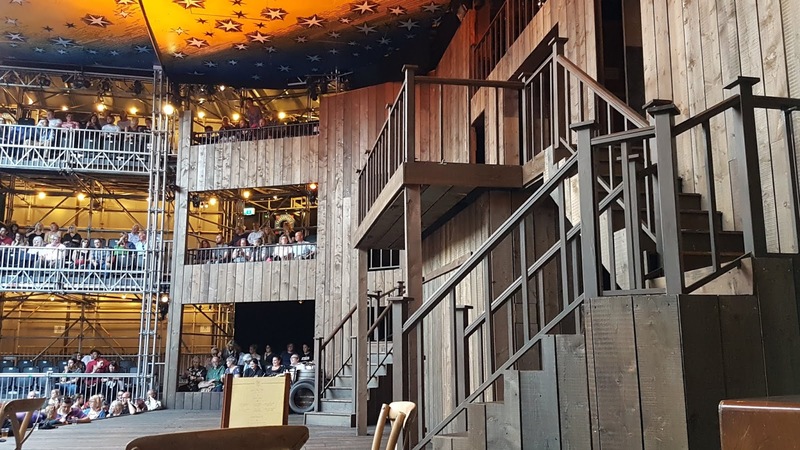 Inside the 13 sided temporary theatre (based on the 1587 London Rose Playhouse and pre-Globe Theatre) we headed for our seats. The lady inside told us to “head all the way round” so we did. 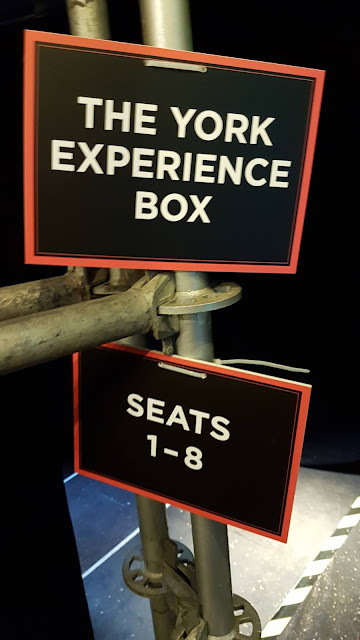 Then we saw a sign…”The York Experience Box”…erm that can’t right…that’s like sitting on stage almost…they were the most expensive tickets in the whole place…no…best to head back to the usher. “Erm, you know when you said head all the way around…did you mean ALL the way round?” “Yes… to the bottom…first row.” So we headed back, and took our seats right next to the stage. It was a spectacular view…it was like being allowed back stage and peeking through the curtains on the wings. How on earth my friend managed to get such great tickets for such a great price was astounding, and yes, I’ve told her that in future she is in charge of all future theatre purchases!! The show was fabulous. It had been reworked into a 1930’s Verona, complete with café on one side and a discarded bicycle on the other. Obviously the first thing that entran ced me about the production was the costumes! I loved the fairy like costume Juliet wore to the party towards the beginning of the play, and as the play continued, in my head I was reworking many items into something more wearable, especially Juliet’s high waisted trousers which I coveted! Something else that captivated me was Mercutio’s blue velvet catsuit, unfortunately that was the only thing that did captivate me about Mercutio. Normally Mercutio is a male character, but in our modern world of theatre, women can now play men’s characters. (Let’s face it, in the origins of theatre, men played women’s roles, so what’s the difference?) The problem here was that Shanaya Rafaat’s Mercutio was more shouty that witty and a mix of tom-boy one minute and party-queen the next. Her death was a blessed relief and meant that we could concentrate on the stars of the show – the star-crossed lovers themselves! From the moment he burst through the central doors to deliver the prologue, Alexander Vlahos (Versailles) showed he was going to be a vibrant Romeo, even when arriving at the party donned in a harlequin suit and mask he still connected well with the audience, captivating you throughout the whole play. Even more captivating was when he left the stage and sat right behind us, enjoying the performances of his colleagues alongside us. At one point he was laughing along with us as we watched the groundlings waving their arms in the air. As we turned and looked enquiringly at him (well he must have seen the show a few times) he explained “he’s never made them wave their arms like trees before” it was as if each cast member was making this penultimate show bigger and better than all their past performances. And with those words, Alex darted off back on stage and was once again Romeo! Alexandra Dowling shone as the forlorn Juliet, destined to marry Paris, who in this production is much older and duller than she. She was graceful and came to life with every scene she shared with Romeo, so you could feel her heart breaking at the news that Romeo had been banished from Verona. Sadly this is where Shakespeare’s tale breaks down for me. As practical as ever, if the love of my life had been banished and I had to marry an old boring bloke I’d have just run off with Romeo and start afresh somewhere new. That wouldn’t make for a tragic play though, and audiences don’t always want a happy ending! I guess this is why I will never be a full up paid member of the Shakespeare appreciation society! After the play we headed to where the actors should come out. I was surprised that no-one else seemed to be there, but patience reaps its rewards and Alex Vlahos headed out and was kind enough to sign my drawing and to offer me a packet of Haribo. He saw me friends sitting further away and headed over them to hand out more packets…a surreal experience that we were a bit tongue tied to comment on with him. It looked as though all the ladies had left as darkness enveloped us and so we booked a taxi to take us back home. As we started heading down the road I caught a glimpse of a brown coat and recognised it as Ali’s. Out of the gloom I started scampering towards her waving my piece of paper to get it signed by her too. 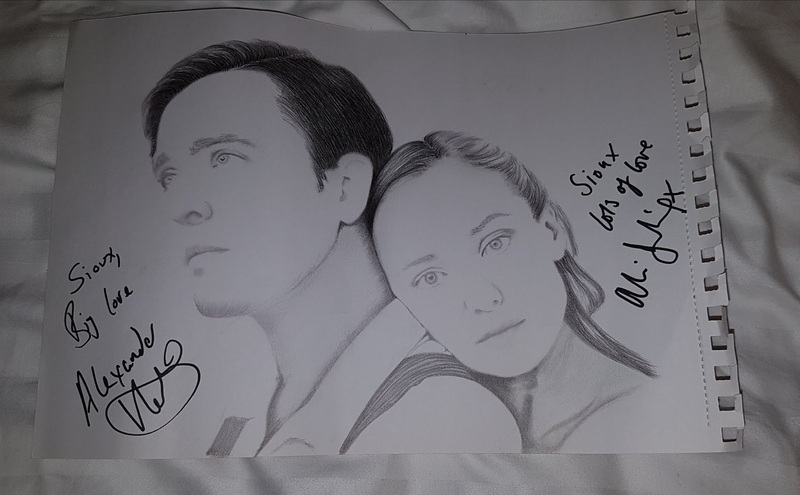 After apologising for the fact it was only half finished, she chatted whilst signing it and then I headed back down the road to join the others and the waiting taxi driver! It was the perfect end to a perfect evening. Sunday morning started bright and sunny, and as I only had to make it through one day at work (Monday) and could have a lie in on Tuesday (yes 7:30 is a lie in) I wasn’t in a rush to drive back home. 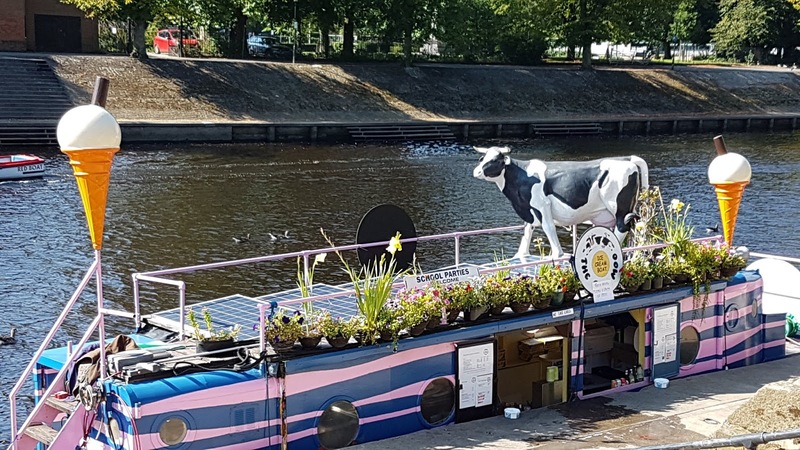 We headed towards the river and saw an ice cream boat, complete with mahoosive plastic cow on the top, and decided it would be rude not to have ice-cream for breakfast on such a glorious sunny day. Nikki “3 scoops” as she will now forever be known, led the way. As we sat at the side of the river, we finished our unorthodox breakfast and went to get on the boat…which by this time was full (unless we sat inside, downstairs.) Hmmm, we’ll get the next one, just time to head to the Christmas shop and cause chaos. Yes you heard right…Christmas shop. Trinkets bought (and now home and wrapped) we headed back to the river, picking up a strange stone object tucked onto a wall enroute, and got a good seat on the top of the boat. York Minster was next on our agenda, and complete with our shopping we attempted the 275 steps to the top of the tower. 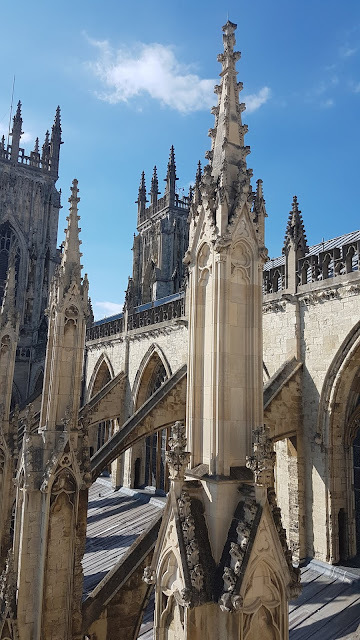 Half way up there’s a walkway and the perfect opportunity to take ome photo’s of the Minster’s glorious architecture. The sun was casting fabulous shadows and so I took some shots for that week’s photography challenge. (Yes I am still doing my photo course…no I haven’t opened the notes for a while.) Having submitted a couple of photo’s to the student forum someone said the photo would be even better if I had got done a bit lower and the shadows would be exaggerated. This was a fair point, well made, however I wonder what they would have said if they’d seen me hanging onto the railings mid-air, camera in one hand and shopping in the other, trying to take a decent picture! After that adventure there was only one place left to visit before heading home…Betty’s. For those unfamiliar with Yorkshire, Betty’s is THE place to go for afternoon tea. We had the most delightful waitress and were spoilt with beautiful food, and once sated, we then headed to the shop to buy some goodies to head home with. I bought some cake for work. As the lady rang the items through the till she mentioned the cake only had a best before date of a couple of weeks and was that ok. I told her not to worry…if the cake made it past a couple of days it would be a miracle. So there you go. A bit of pontificating and fate allowed me to have an unexpected and glorious weekend away, with good food, great friends and a wonderful ambience. Who could ask for more?